TRW CEO John Plant, left, and ZF CEO Stefan Sommer. German auto supplier ZF Friedrichshafen AG said today that it has completed its $12.4 billion acquisition of safety systems supplier TRW Automotive Holdings Corp.
TRW will operate as a division under ZF called active and passive safety technology. “The combined company is a powerhouse of automotive technologies, ranging from driver assistance and occupant safety systems to drivelines and transmissions and braking and steering systems,” TRW CEO John Plant said in a statement. The total value of the transaction, including assumption of debt, is $13.5 billion, the companies said last July when the deal was announced. ZF CEO Stefan Sommer told Crain’s Detroit Business, an affiliate of Automotive News, in January that Plant would remain with the company after the deal closed, but the scope of his role is unknown. The combined company will have 138,000 employees. Sommer told Crain’s that he foresaw no overlapping of the two companies' business. 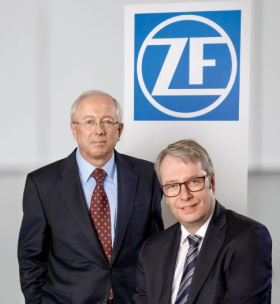 The integration of the two companies is expected to last three to five years, ZF said in the statement. The deal creates the second-largest auto supplier in the world, according to the Automotive News list of the top 100 global suppliers. ZF reported global sales to automakers of $20.4 billion in 2013, with TRW posting $17.5 billion in 2014. Robert Bosch GmbH remains the No. 1 global supplier with $37.7 billion in automotive revenue. The current No. 2 is Denso Corp. with $35.9 billion, based on 2013 data. Outstanding shares of TRW, which are traded on the New York Stock Exchange, are delisted as of today.